For the Indigenous Community of Kato, North Pakaraima, Potaro-Siparuni (Region 8), farming is intrinsic to the way of life for the over 400 residents, who depend on it for economic survival. Over the years, due to climate change and periods of extreme drought and floods that have ensued, the farmers have suffered financial loss. However, interventions undertaken by the Food and Agriculture Organization (FAO) in collaboration with the National Agricultural Research & Extension Institute (NAREI) and the Guyana Livestock Development Authority (GLDA) have now propelled the village closer to achieving food security and sustainability. The village no longer imports paddy and rice from coastal regions, but is now cultivating its own rice, thanks to the interventions made possible by the agencies. He said that the agencies along with the farmers have planted three rice varieties which are thriving. “So far, it is doing very excellent in our community, we are looking forward to being able to produce rice in the next two years. We can supply our schools and other immediate communities. This will also create a larger scope for our marketing side where instead of importing paddy and rice from the coast, we are producing it right here,” he added. Felix Gerrard, Project Coordinator for the Agriculture Disaster Risk Management (ADRM) Project said that the project, which is being implemented in Guyana, Suriname and Jamaica, is funded by the FAO. The total funding for the project is $89M (USD$425,000) allocated to the three countries. “The Guyana component is $24.6Million (USD$113,000) and we decided to identify Hinterland Communities where we can address issues of climate change and the adaptability of the communities to the effects of climate change whether it be drought or floods,” Gerrard explained. A ‘scouting mission’ was done in June 2018 where the organisations eventually zeroed in on three hinterland communities – Wowetta in Upper Takutu-Upper Essequibo, Kato in Potaro-Siparuni and Paruima in Cuyuni-Mazaruni. “In Kato, we have three interventions. 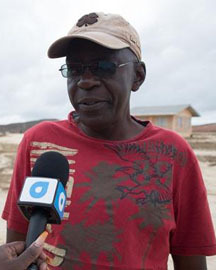 We have a Cassava seed bank, and we also have Black Giant Birds which we also get from GLDA and these birds grow up to about 10-12 pounds and they are very resilient, and this is a backup to the community so that they can have food in the event of any disaster-related activities,” Gerrard stated. The ‘black giants’ were introduced in Region 8, last year, and are now yielding eggs that will also supply the almost 350 students, teachers and auxiliary staff living at the recently commissioned Kato Secondary School. The GLDA initially launched its Hinterland Development Black Giant Poultry Programme in 2017. The main objective of the initiative was to assist in making the hinterland regions less reliant on the coast for food supplies. The Black Giant is a large dual-purpose chicken, which can produce up to two hundred (200) eggs annually and about 4.5 kilograms of meat. These birds can graze and forage as well as eating leftovers from the kitchen and still produce reasonably well. Given these qualities, the bird is well suited to Hinterland Regions.